With the recent release of the movie, The Greatest Showman, I've once again become intrigued with Barnum. I will say that this movie has about as much to do with Barnum as the Tony Curtis movie about Houdini had to do with Houdini. But, like the Tony Curtis movie, it's an enjoyable film. I'd like to examine the real Barnum for a moment, specifically his connection to the world of magic. If you're unaware, his connection is huge. 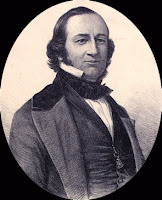 Phineas Taylor Barnum was born in Bethel CT, July 5th 1810. Consider, Abraham Lincoln was born in 1809, Robert Houdin was born 1805 and you'll begin to understand where Barnum fits in history's timeline. In 1836, Barnum had created something he called "Barnum's Grand Scientific and Musical Theatre." This was a traveling troupe of performers and had on the bill a gentleman by the name of Joe Pentland. Mr. Pentand was a magician, and at some point, Barnum acted as hidden assistant to his act. 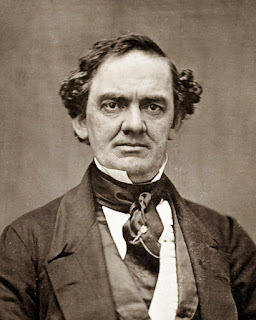 This job seems to be shortlived however, as one faithful performance, Barnum, while hiding inside a table, was bitten by a squirrel, which caused him to straighten his neck and legs and thus collapse the table which he had been hidden inside of. In February of 1837, Barnum sold half his interest in Barnum's Grand Scientific and Musical Theatre to a man named Henry Hawley. Mr. Hawley was a magician who performed many standard tricks of the day, including the 'egg and bag trick'. According to Barnum's Autobiography, Barnum's Own Story, this was the trick were multiple eggs are produced from a bag, and then eventually a live chicken. This is quite different from the 'egg and bag trick' many of us are familiar with today. This was the original age old version that dated back to the time of Issac Fawkes. Hawley, remained with the show until August 1837, when Barnum dissolved their partnership. In 1841, Barnum purchased Scudder's American Museum. Scudder's was a run down place featuring mostly taxidermy displays. When Barnum took it over, he transformed the building inside and out. He added performers, freak show entertainers and more. Among his most popular freak show entertainers was General Tom Thumb. Barnum met Tom (Charles Stratton), when the boy was only 4 years old. He brought him to his museum and soon took him on a tour of Europe. Barnum first sets up shop in London, at a place that would one day be known for magic, Egyptian Hall. In here he shared many curiosities, automaton, and General Tom Thumb. It wasn't long before Barnum and company received an invitation to visit the Queen. The company was coached in proper etiquette, but that would go awry when young Tom Thumb would speak out of turn to Queen Victoria. She loved it. And Barnum and company were invited back a second time to the palace. Barnum attended the World Exposition in Paris, while on tour in Europe in 1844, . This is where he happened to see Robert-Houdin and his many wonderful automaton, for the first time. Barnum was most intrigued with Houdin's latest creation, The Writing and Drawing automaton. The device was a small human like figure who was very lifelike in both appearance and physical action. By all accounts it was much more than a wind up novelty, this automaton wrote or drew according to the question asked. Robert Houdin to see his various automaton. The King was quite inquisitive and Houdin enjoyed the banter. But when the King came upon what was really the crowned jewel of the display, The Writing and Drawing Automaton, things really got interesting. 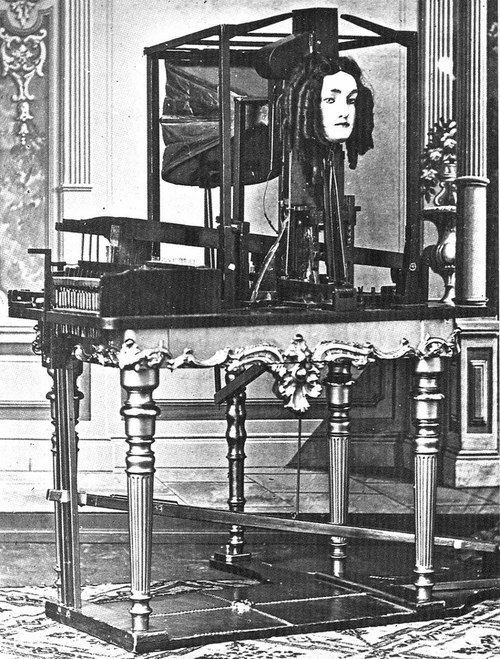 Houdin explained what the device could do and then suggested to the King that he ask the automaton a question. The King asked, "How many inhabitants does Paris contain?" The automaton began to raise it's arm, which allowed a sheet of paper to be placed on it's table. Then the little figure lowered it's arm and began to write, "Paris contains 998,964 inhabitants." The next test involved the King reciting a poem, but leaving out the final line. The King gave the first three lines of the quatrain, and then the little figure wrote out the last line to complete the poem. The final test involved the automaton's ability as an artist. The King turned to the Comte de Paris who was in the King's entourage, and said, "choose your own subject for a drawing." The prince who was heir to the thrown, chose a crown to be drawn. 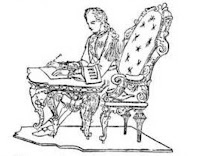 The automaton began to fashion a crown on the piece of paper but in the midst of drawing the pencil lead broke, preventing the drawings completion. 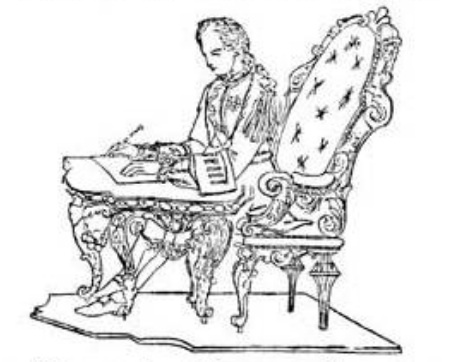 The King spoke up and said to the Comte de Paris, "As you have learned to draw, you can finish this for yourself." The Christian Fechner book, The Magic of Robert Houdin An Artists Life Volume 1, points out that this was a forewarning of events to come, as the Comte de Paris never took the thrown. In the book, Struggles and Truimphs: Forty Years' Recollections of P.T. Barnum, by Barnum, he shares the story of meeting Robert Houdin. Barnum attended the Exposition specifically to find new curiostities for his museum, and right there he purchased from Houdin the Writing & Drawing Automaton, along with numerous other automatons. While in Paris, Barnum attended Robert Houdin's Soirees Fantastic, and was always introduced by Houdin to the other attendees. Barnum sent the Writing & Drawing Automaton to London to be put on display and then later shipped it off to his museum in NYC. Sadly, the fire which destroyed the Barnum museum in 1865 destroyed the legendary Houdin automaton, along with many other irreplaceable treasures. Let me back up slightly to 1856. At this time in history, there were three names that reigned supreme in American Magic History, Signor Blitz, Wyman the Wizard, and Jonathan Harrington. 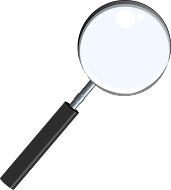 They all had similar acts which included magic, ventriloquism, and imitations. Ventriloquism back then was different from what we think of today. They used no mechanical dummies to speak through. Rather, they 'threw their voice' and made it appear that sounds, and talking, were coming from other places. In regards to the imitations, they would recreate the sounds made by animals, birds, even machinery and such. All three gentlemen were well known by Barnum. In fact, Barnum had hired Harrington previously to perform for him at an exhibit in Boston. Blitz performed at Niblo's Garden, right near the Barnum Museum, and was on friendly terms with Barnum. Blitz in fact, may have been the most famous magician in the country at the time. It's said that there were 13 other performers working throughout the U.S. claiming the name Signor Blitz. Finally, we come to Wyman the Wizard, who was extremely popular and one of the most financially successful magicians of his time. One evening in 1856, the three men attended the first American performance at Barnum's Museum of British ventriloquist and mimic Lionel Goldshmidt. The theatre was sold out and the anticipation was great for this renowned performer. The only problem was, he had not shown up for the performance. As it got closer and closer to showtime, Barnum began to panic. He went to his three magic friends in the audience and asked if they could fill in. Blitz, declined because he did not have his equipment with him. Harrington similarly excused himself from performing. It came down to Wyman the Wizard who agreed to fill in. Barnum rushed him to the dressing room and quickly applied a fake mustache and beard to Wyman so that he might look more like the famed British Ventriloquist. Wyman then went out and performed an impromptu performance of imitations and ventriloquism. He produced the sounds of many different animals and then had comedic conversations with members of the audience, thought it was Wyman's voice doing the talking from the audience and the answering. Barnum was relieved and elated. And that was not the only time Wyman worked for Barnum. According to Houdini (via MAGIC by David Price) while in NY in 1850, Wyman was under management of P.T. Barnum! exhibition of a new invention called an annihilator, which I gather was some sort of fire extinguisher. A building was about to be set on fire so they could demonstrate this new device, but before the fire was set, voices were heard coming from the building saying, "Don't! Please let me out! Don't burn me up!" The building was then searched, but no one was found inside. So again, they attempted to set the building on fire, but once again, voices were heard screaming out for help. After another search, they attempted to yet again set the building on fire but this time the sound of barnyard animals could be heard coming from the building. It then dawned on Barnum exactly what was going on, it was his friend Blitz creating the havoc. This story comes from the book P.T. Barnum the Legend and the Man by A.H. Saxon. The end result was the two men having a long standing feud. In the late 1850s Barnum was back on England on a lecture tour. He hired the famous European magician, Kratky Baschik to perform on his tour. I would surmise that Barnum was always on the hunt for talent and oddities in his travels. For example, in 1873, he featured an Italian Magician by the name of Patrizio, who performed a feat known as, "Catching a Live Cannon Ball". It was also around this time he hired Professor Verbeck from France to tour with his show in the United States. 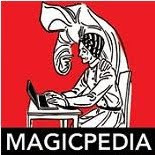 The Illustrated History of Magic by Milbourne Christopher describes John Henry Anderson, The Great Wizard of the North, "as the Barnum of nineteenth century bafflers." The book goes on to describe how Anderson would not just put up one or two posters advertising his shows, but rather he would paper the town, covering every available inch of space on a wall. The book even claims he put posters on the Pyramids in Egypt and on the cliffs of Niagara Falls! Anderson is also credited with the grand parade that was later copied by many circuses. One wonders who came up with this first, Anderson or Barnum? But, looking at his period of time, John Henry Anderson was born in 1814 and died in 1874. And, Barnum and Anderson knew each other well. The Illustrated History of Magic shares a story of Barnum having dinner with Anderson and the later introducing people to Barnum saying, 'he is the Great Wizard of the North'. He apparently played along at first but then started giving out 'free tickets' to people who came over. Once the REAL Great Wizard of the North realized what was happening he quickly reclaimed his title and put a stop to the free tickets! Now, we all know about Barnum's Fiji Mermaid, and his famous Siamese Twins, and even the dog faced boy. But have you ever heard of Euphonia? Probably not. I hadn't. I saw a photo of a playbill for it in David Price's book, MAGIC A Pictorial History of Conjurers in the Theatre. 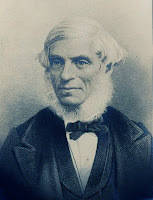 The book only contains a single sentence on the device, "Professor Faber's talking machine automaton was exhibited by P.T. Barnum in 1873." That's it, no other information. So I had to do some digging. It turns out that Joseph Faber was a German inventor, scientist who in 1840 created the first talking automaton. But because of the lack of interest in the device, he destroyed it! In 1844 he built another one but discouragement soon set in due to lack of interest and he again destroyed it. In 1845 he was building another one. What was this device? It was made almost entirely of wood and rubber and had a keyboard which could produce various sounds. The device also had a bellows which created the flow of air combined with the keyboard made the sounds. A female face was mounted to the device and in 1846, Barnum found out about it and purchased or leased it, I'm not 100% certain which. He sent the inventor and the machine to London where it was exhibited at Egyptian Hall. The inventor and the device made it's way through Europe before coming back to America and being put on display at Barnum's Museum. 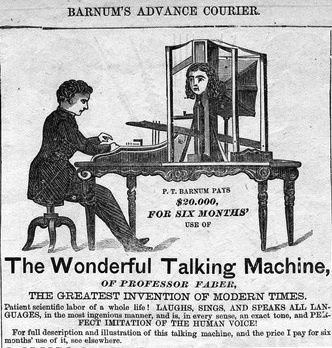 Somehow the Wonderful Talking Machine-Euphoria, escaped the devastation of the Barnum Museum Fire of 1865. Perhaps the device was on tour at the time. Barnum continued to feature the device, even in his traveling circus as late as 1873. To the right is a photograph of the automaton taken by famed Civil War photographer Mathew Brady. I know there are more connections to magic by Barnum, I have not uncovered them all. In my next article, I'll be sharing a fascinating story of another artist who often gets compared to Barnum. It's quite the revelation, and one you'll want to read!